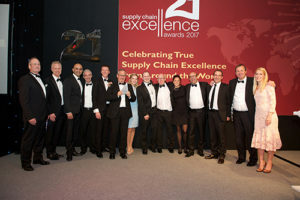 There were high scores in this category, which is good news as Demand Forecasting & Planning is a core activity within supply chain management. However, the two highest scoring entries were Pearson with Accenture and Warburtons with FuturMaster. From left to right: Brodie McMillan, Logistics Director, Whitbread, Ian Mallinson, IT Director, Warburtons, Hitesh Patel, Project Manager, Warburtons, Russell Barnes, Commercial Forecast Manager, Warburtons, Simon Green, IT Business Partner, Warburtons, Peter Paisley, Capability & Customer Supply Controller, Warburtons, Heather Clay, Commercial Strategy Controller, Warburtons, Martin Sewell – Presales Consultant, FuturMaster, Martin Ogden, Head of IT Applications & Architecture, Warburtons, Stéphanie Duvault-Alexandre- Senior Business Consultant, FuturMaster, Michel Ramis- EVP Sales & Marketing, FuturMaster, Iain Bishop, Senior Commercial Forecast Manager, Warburtons, Nick Giuffrida- UK Sales Director, FuturMaster, and host Sara Pascoe. Pearson Education is an educational publisher specialising in mobile learning for education and training. Last year the business engaged in an ambitious global sales and operational planning transformation programme, which has delivered significant cash savings and has helped to revitalise the way the company operates. The transformation enabled the business to significantly improve service levels, cash management and obsolescence through its dispersed global supply chain. The impressive benefits, in the form of cost savings, reduced inventory and increased profitability, were duly noted by the judges. They could also see that the wider implications for a revamp of the global supply chain strategy to drive greater collaboration – internally, with suppliers and with customers – showed great promise. Although the judges rated the entry and could appreciate the scope of the project, they felt there was another entry that just had the edge. Perhaps there would be more to see next year? With sales of £551 million last year, Warburtons is one of the largest bakery brands in the UK, delivering daily to over 18,500 retailers. In the last ten years the company has doubled in size, which prompted a replacement of its aging IT systems with demand and promotional planning software from FuturMaster. Forecast accuracy has risen by six per cent – a significant improvement when producing over two million bakery products every day. The team are also responsible for managing promotional volumes and measuring the impact of other external factors, such as advertising activity and the weather. The way the business has gained improved visibility on future expected sales in a market that requires high accuracy and speed, in the light of the short shelf life of the product, gained the praises and appreciation of the judges. This was a well-executed project that has delivered substantial results. There was little doubt that Warburtons with FuturMaster should be the winner of the Demand Forecasting & Planning category Award.